This is the location on the local hard-drive where downloaded files will initially be saved. 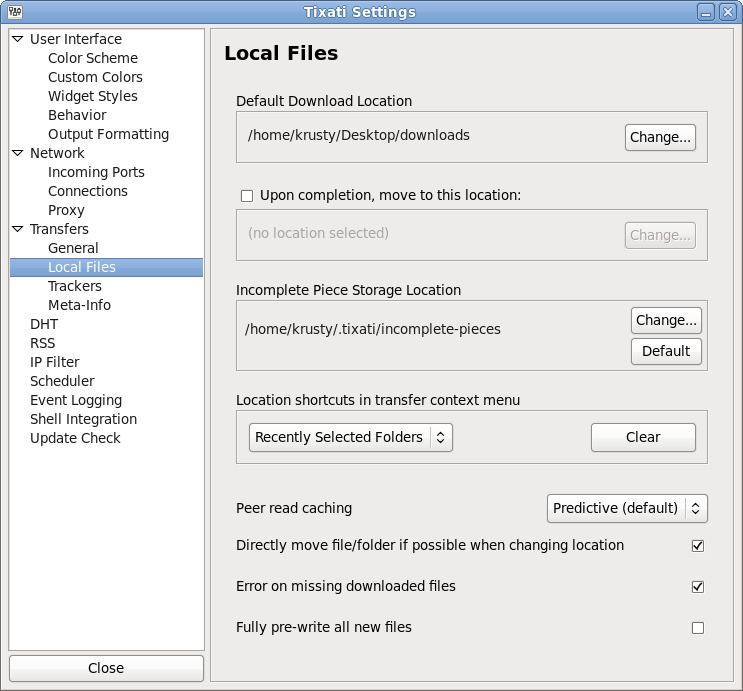 The location of downloaded files for an individual transfer can be changed in the 'Options' tab in the transfer properties. If this option is set, the local downloaded files will be moved when a transfer completes and starts seeding. This can be overridden per-transfer by changing a setting in the 'Options' tab in the transfer properties. This is where the software will store small fragments of downloaded pieces before they are complete. The data is stored separately because only complete pieces can be hash-checked for integrity, therefore it would be dangerous to save this data into the main downloaded file. This location should have at least 40-50 MB of free space available otherwise data may be lost between sessions. The user may choose to use the most recently selected folders for a shortcut list, or a custom list of folders. When using the customized option, the 'Clear' button will be replaced by the 'Customize' button which will open the Customize Location Shortcuts window. If this option is active, all moves within the same hard-disk partition will happen by re-linking the file to the new location instead of moving it by copying / deleting. If this option is active, a transfer that has previously created it's files will stop with an error if it can not find those files the next time it is started. This prevents re-downloading data that may simply have been moved to a different location between sessions. If this option is not active, the transfer will simply re-create the files from scratch and start downloading from the beginning. Using this option will help prevent disk fragmentation on certain older filesystems, but will also cause a delay when new transfers are initializing due to the need to write out the entire file (with zeroed data) to the hard-drive. Only use this option if you are sure you need it.